From the minute you walk through the front door you will feel the warmth of this home. This charming family home will provide quiet nights and wondrous memories gazing at the magnificent red rock views. The large master bedroom complete with private bath and walk in closet will help you settle in to your vacation rental. The kids room boast full size lower and twin upper beds that will provide wonderful places to slumber for the younger guests. If you are traveling with extended family they will be surprised to find they actually enjoy the pull out sofa sleeper with futon mattress and foam topper. There is an observation deck complete with dining table and chairs which provides for perfect viewing of our world renowned sunsets. 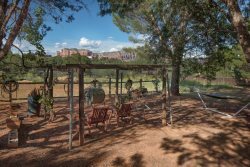 Located in the beautiful Chapel area of Sedona and only a few steps away from hiking trails!